These are tough times for UK food as two recent government surveys have shown rising levels of pesticide contamination as well as record levels of campylobacter in British chicken. The first survey was released by the Expert Committee on Pesticide Residues in Food (PRiF) as part of its annual reporting this month. The PRiF tested 3,450 samples of 41 different food types, finding residues in 48% of them – with 3% registering above the maximum recommended level (MRL). Food from outside the UK was more likely to contain traces of pesticides with 53% of samples testing positive. Of the 1,729 food products from inside the UK, that figure stood at 42%. The rise in pesticide residues found likely reflects the greater number of pesticide residues looked for. For example, in 2015, PRiF looked for 388 pesticides in fruit and vegetables, 73 in animal products, 346 in starchy foods and grains, 353 in infant foods and 346 in other groceries. In 2016, it checked for 374 pesticides in fruit and vegetables, 365 in animal products, 371 in starchy foods and grains, 376 in infant food and 370 in other groceries. This means PRiF increased its scope by 23%. In bread samples tested, 86% contained residues of at least one pesticide and 25% contained more than one. In breakfast cereals, 93% of samples to contain at least one, and 65% showed traces of more than one pesticide. In grapes, 95% tested positive and 83% had more than one pesticide. Other notable products that frequently exceeded the MRL included: cumin (50%); okra (26%); beans with pods (24%; rye flour (21%); and buffalo, ewe and goat cheese (11%). In the case of the buffalo, ewes and goats cheese all residues above the MRL were of the quaternary ammonium compounds BAC (benzalkoniumchloride) or DDAC (bicecyldimethylammoniumchloride), used as disinfectant during productions. While the report emphasised the low amount of foods with residues above the official ‘safe’ level this reassurance does not take into account the fact that we do not eat single foods. We eat multiple foods every day; and since many pesticides accumulate in the body levels can easily build up. In addition, combinations of pesticides may be more harmful than single exposures. This year has also seen an unfolding scandal on British chicken. 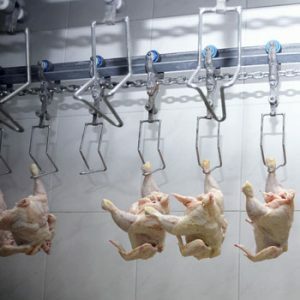 Most recently one of the UK’s biggest poultry processing operations, 2 Sisters, accused of poor hygiene standards and allegedly altering food safety records (claims which 2 Sisters has vigorously denied). Earlier this year a survey from the government found record levels of superbugs resistant to some of the strongest antibiotics in British-farmed chickens. The Food Standards Agency, which tested a large sample of fresh whole chickens from retailers, reported “significantly higher proportions” in the last 10 years in instances of campylobacter, a harmful bacteria, that is increasingly resistant to the antibiotics commonly used to treat it. In all more than 4,000 samples were tested. Those that tested positive for campylobacter were then retested to see if they carried bacteria resistant to the key antibiotics. Ciprofloxacin resistance was identified in more than half of the samples: for example, in 237 out of 437 tests on Campylobacter jejuni, and in 52 out of 108 of another strain, Campylobacter coli. The report also found that the proportion of campylobacter-infected chickens which showed resistance to key antibiotics, in this case the fluoroquinolone ciprofloxacin, “has increased significantly” compared with a previous survey of chickens sold in supermarkets 10 years ago. Antibiotics are routinely given to intensively reared chicken to prevent the diseases which arise from the overcrowded, stressful and unhygienic conditions in which they are reared. The results are concerning because resistant bacteria in livestock can easily spread to humans, making vital medicines ineffective against serious diseases. Does anybody really believe eating pesticides is safe? !